Early last the month, we were all being told that our 5 a day fruit and vegetable portion should be increased to 7 a day. Well, I have to put hand on heart and say, even though I am a vegetarian, I don't always hit the 5 quota a day, sometimes not even the 3, but then there are days when I hit 10. Anyway, no preaching here. 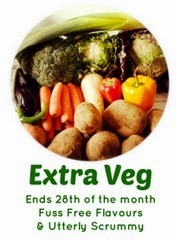 I would like to announce today that I have the pleasure of hosting #Extra Veg this month. Extra Veg challenge was launched by Helen of Fuss Free Flavours to encourage us to eat extra vegetables. As my blog is 100% vegetarian, I would like to challenge you to come up with either a vegan or vegetarian savoury dish. This particular dish could be a tart, a quiche, a curry, a stew, a salad - anything as long as its Savoury and Vegetarian. For the Round Up Please Follow this Link. My blog is only a few weeks old, but this could be right up my ally. I've been thinking of new ways to get different veg into my diet and maybe this challenge will force me to follow through. Such a great idea! Oh welcome to the blogging world Kelly. It has change a lot since I started 6 - 7 years ago. I hope you participate, its a great way to to mingle with other bloggers. Aaah bother! I have an entry but it's not vegetarian. Ach well! Elizabeth :) still plenty of time to participate its so early in the month. Not sure if mine really fits the brief --- yes, it's vegetarian, but no, it doesn't use a veg that is outside my comfort zone. I suppose you could do the same dish with okra (which I detest) or Globe Artichokes (which are too much trouble), but I used veg that I LIKE! P.S. The thing which allows you to crop your own image for the thumbnail picture is really difficult to use! Thanks Mark, most appreciated. I will tweak the criteria a little so its not going to be necessarily out of ones comfort zones, so long as its a savoury veg dish. I agree about the linky thing re cropping your image. I've had issues with it too, but unfortunately that is how it works. when i post up the round up, i will use full image. mine blog is too 100% vegetarian so happy to participate in this, only one entry allowed i guess right? Lovely to have you on board, Linsy - the limit is three. You have a lovely blog. Over the years I realized how including lots of vegetables in my meal makes me feel more active and energetic. Aha! Husband and wife rivalry going on - I see Mark's already joined in but here I am trailing along at the back! :) Thank you Jane. I had to encourage Mark to join in and I am pleased he did so, but I am also so pleased that you are participating too. Thank you so much.